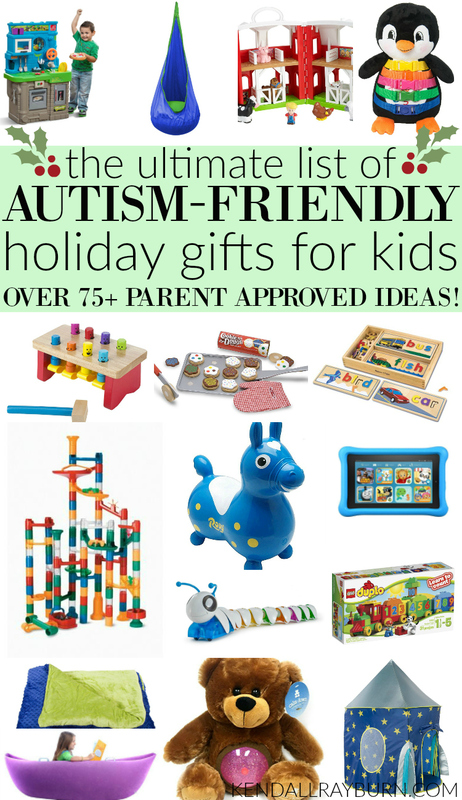 Autism-Friendly Holiday Gifts for Kids - 75+ Parent-Approved Gift Ideas! The Kendall Rayburn Blog is a participant in the Amazon Services LLC Associates Program, an affiliate advertising program designed to provide a means for sites to earn advertising fees by advertising and linking to Amazon.com. Thank you for shopping through these Autism-Friendly Holiday Gifts for Kids to help to support this blog! Hope you’re having a lovely day! Can you BELIEVE it is November already? You know what that means, it means the holidays are right around the corner. And if you’re anything like me, you like to get your holiday shopping done early so you can really soak in the magic of the season. One of the questions we get asked every year is what people can get Wyatt for Christmas. 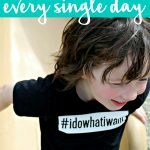 This year, I wanted to make a large gift guide for parents of kiddos with Autism, and for people who are buying for kiddos with Autism so they had an easy guide filled with parent-approved items to purchase. Who are these parents? Myself and members of many, many Autism support groups that I’m in. I posted a call-out on the Facebook pages and asked for their suggestions! 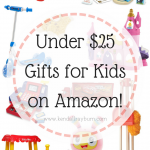 Below you will find a list of over 75+ items loved by little ones with Autism from all over! Little Tikes 3′ Trampoline | We have this in our playroom and my kids absolutely love it! It’s perfect to bounce out extra energy. If Wyatt is too wound up, or needs to do something where he is required to sit still, we have him bounce first before attempting that task. Toysmith Liquid Motion Bubbler | We have a few of these in our home. They’re very calming and great for sensory play. Tangle Relax Therapy | Like the bubbler above, this is a great fidget toy. If you’re attempting a long car ride, these are perfect to have on hand! Jelly Beadz | These are great for creating sensory bins at home. They’re easy to make, and they are fun to sort into cups, or pair with these fun artic plastic animals! Hippity Hop Ball | This is so easy to inflate, and fun for kids to enjoy! When you’re done, simply store it in your closet! Chewy Tubes | These are our FAVORITE chewy’s. They’re easy to hold, and perfect for that extra oral stimulation (especially if your kiddo grinds his/her teeth). Hanging Hammock | This is on our gift list for Wyatt this year. I’ve been searching for different cozy little spots for him to have that swinging movement. And this hammock has both great reviews and is offered at an affordable price! Penguin Race | I’m not sure what it is about this toy, but it’s completely mesmerizing to watch and oh-so soothing! Magnetic Fishing Game | We love things like this, because it’s something we can do together, or individually. Plus, it’s great for developing those motor skills! Monkey Balancing Board | This is another great item for getting out energy, and working on balancing skills. Fine Motor Tool Set | These are a must-have for our sensory bins. Perfect for little hands and fine motor development. Pod Swing Chair | This is another item that’s on our list this year for Wyatt. It’s a hanging pod chair, perfect for him to climb up into with a book or toy to take a breather. Lego Duplo Building Set | Legos are just incredible, these are a little bigger and kid-friendly, perfect for building sessions. This Numbers Train Set is one of our favorites! Fisher Price Barn | This is one of Wyatt’s favorite toys, ever. He got it when he was about 18 months old and he STILL plays with it. We love that it has different animals, doors, and is really interactive. It’s been great for language development, too! Pounding Bench | I love all of the colors and play options that this provides. It really draws attention and keeps it, too! Wooden Latch Board | I really believe these are great for any age, they’re great fidget puzzles for car rides or down time. Scissor Skills Activity Pad | Need to practice scissor skills? This pad is inexpensive and really engaging. The colors are bright, activities are perfect for a beginner. We love it! Wooden See and Spell | My son loves letters, spelling, and is now starting to read! This is great to help build words! Plus, it’s wooden – so it’s really durable, too. Pretend Bake Cookie Kit | My son loves to bake, so these pretend cookies are right up his alley! Pretend Food | Help your kiddos learn their food groups with these fun pretend fruits and veggies! Shape Sorting Cube | We can’t get enough of this shape sorting cube. It helps give a visual to different shapes, and can be used as a learning activity. Reuseable Sticker Pads | My son loves these! And I love that they’re inexpensive, and he is able to remove the stickers and replace them with ease! You can find all kinds of themed sticker pads to fit your child’s interests. Catch and Count Fishing Game | This is a bigger version of the fishing game mentioned above, perfect for family game night! Lace and Trace Pet | This is a fun and simple activity that helps to build fine motor skills, also great for kiddos who love animals. Wooden Sanwich-Making Set | My son loves making and building sandwiches! This has always been a fun activity that keeps him really engaged and also prompts him to discuss what he’s doing or making! Wooden Lacing Beads | Another great fine motor skill activity. Wooden Alphabet Magnets | These are durable and fun to use on the fridge or a magnetic board! Bean Bag Toss | A great and engaging family game! Shopping Cart | Perfect for storing all of that pretend food, and for imaginative grocery store play! Wooden Block Set | Get ready to build and have lots of fun with this 100 piece set! Pretend Cash Register | Perfect for learning about money, counting, and sorting! Take Down Play Mat | Perfect for traveling! Play-Doh | Classic favorite, we LOVE playing with it! It’s great for rainy days when you can’t get outside. Play-Doh Factory Set | We have so much fun mixing colors and running them through this handle operated toy. Thinking Putty | Great fidget item, fun to mold! Slime | This is such a great sensory activity. You can make your own at home by following this recipe! Step2 Deluxe Art Master Desk | If your little one is an artist, they need this full desk! Perfect for storing art supplies, and creating! Curve-A-Beam | Perfect for indoor or outdoor play. Step2 Cottage / Playhouse | We have one of these in our back yard and it’s a year-long favorite. It’s really durable, and you can clean it and move it inside for the winter! Bean Bag Chair | For flexible, surrounding, fun seating. 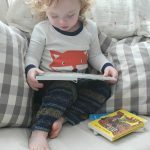 Fire Kids Edition Tablet | BEST GIFT EVER. This fire tablet is under $100, comes with free Amazon Underground where you can download free books, games, apps, etc. My son loves to use his to read virtual books, and play his games. And I get to monitor what goes on it – and how often he plays. And bonus, it has a two year worry-free guarantee so if your kiddo breaks it, they’ll replace it! Weighted Blanket | Soft, cozy, and great for those who really enjoy that calming sensory sensation. I love that it’s multi-use, you can fold it and put it on your kiddo’s lap, and take it for travel, too. Bath Letters | We love these for bath time, because what kiddo doesn’t love bath time? Munchkin Falls Bath Toy | We have and love these! They are so much fun to use in the tub and great for outside play too if you have a water table! Tub Crayons | Perfect to keep your little artist entertained for bath time! Tub Submarine | We love this for both rinsing hair and to play! Step2 Teenage Mutant Ninja Turtle Kitchen | My boys LOVE this. It’s really interactive, has lots of fun add-ons, for a full review with photos head here. Marble Run | SO many mommas gave amazing feedback about these marble run kits, perfect for older kiddos! Bubbles | We love bubbles in our house, we love the Fubbles brand, they have everything from bubble wands to bubble blowers, too! Dry Erase Board Set | Perfect for doodling or working on writing! Dress Up Costumes | There are so many dress up items available, choose a few and put together a fun dress up bin! Think & Learn Code-A-Pillar | My son has and loves this. You can arrange the pieces to create different paths, and it’s great for sensory seekers because it lights up, makes sounds for each piece, etc. Check out our full review here. Lincoln Logs | Classic building toy! Play Tent | Perfect to hide away, or great for a calming space! Find more fun play tents here. Pop-Up Play Tunnel | These are easy to set up, they just pop right out – and easy to store, too! Plus you can build a longer tunnel with multipule sets! PowerWheels Thomas the Train and Track | Perfect for a train lover who loves to stay on-the-go! PowerWheels Batman Dune Racer (2 seater) | Great for multipule kiddos, this can seat two. Tactile Ball | Available in many different sizes. Large Sensory Tactile Ball | Perfect for bouncing and tossing. Balancing Tactile | Perfect to practice balance, great playroom addition. Penguin Buckle Toy | Great to keep little hands busy, and minds intrigued. Inflatable Hopping Horse | Great for bouncing and hopping! Coaster Track (round balls) | Great for those who love the marble racers! Tranquil Sensory Bear | Great for those who are soothed by softness, glitter, and teddy bears! Sensory Sack | Perfect for those who are pressure seekers! Easy to store, very portable! Seamless Socks | Great stocking stuffer! Water Table | Water tables don’t just have to be for outdoor play, we love to bring ours into the playroom and fill with dry rice, beans, or uncooked pasta! Lion Guard Training Layer Play Set | Great for kiddos who are fans of the Lion Guard. This play set is great and has a lot of different play options to keep kids entertained! iPad | Perfect for your child to grow with over the upcoming years. 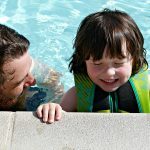 I love that these can be updated often, and have the ability to grow with your child. iPad Durable Case | If you’re going to invest in an iPad, be sure to have a waterproof, durable case to protect it. You just never know what could happen! These are the cases we use. Stamp and Sort Mailbox | Kids can stamp and put mail into a durable toy mailbox. Cozy Canoe | The perfect spot to snuggle in to read, or just relax. Compression Vests | These weighted vests are great for comfort and calming. My son loves his and uses it daily! Be sure to comment below with your child’s favorite toys! Very well written and informative blog it is. But I think Trampoline is also a good option for kids as this helps them to handle their stress and anxiety effectively.